Kieran Band and Jimmy Shields battle for a header. Without a regular goalie available, Kennoway were forced to play defender, Lee Bremner, between the sticks but he was rarely troubled in the first-half. At the other end, Ryan Linton was certainly busier but the only save of note he made came when got down to smother a shot from Ross Brewster. Thornton adapted better after the break and eventually took the lead in the 57th minute when Stuart Drummond netted from the spot after Lewis Grierson brought down Raymond Crichton in the box. Andy Adam came close to extending this lead shortly after with a cross from the right that struck the base of the far post. 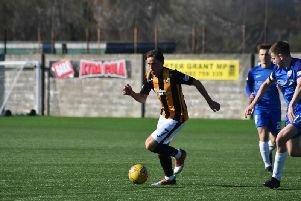 There were loud appeals from the home side for a penalty when Ryan Linton tackled Liam Craig in the 70th minute but these were waived aside by the referee who deemed that the challenge had been legit. The game was held up for a few minutes until it was decided that Linton could take no more part in the game as he had injured himself ‘taking one for the team’. With no recognised ‘keeper on the bench his place was taken by striker, Chris Ireland, meaning we now had outfielders in goals at both ends of the park. With three minutes remaining, Iain Millar headed home Raymond Crichton’s corner-kick to ensure that Thornton would collect the three points that allows them to progress into the next round of the Thorntons Properties League Cup after they topped their group with a game still to play. Kennoway Star Hearts: Bremner, Mair, Johnstone, Brewster, Doig, Band, Grierson, Muir, Nryce, Collins, B.Rolland. Subs: Goodwin, L.Rolland, Craig, Malcolm. Next up for Thornton this Saturday is a trip to Newburgh in the Thorntons Property East Region League Cup while KSH host Rosyth in the DJ Laing East Region Cup.